INDIANAPOLIS, IN (May 13, 2017) – Exclusive Autosport marked a major milestone in its history on the May 11-13 weekend as the team participated in its first official competition event at the Indianapolis Motor Speedway. The growing motorsports operation was competing in the Cooper Tires USF2000 Championship Powered by Mazda, running the 2.349-mile, 14-turn road course that lies within the walls of IMS. The results that unfolded during the three-day event were not exactly what the team expects from any track outing. Despite dealing with the struggles of learning both the new USF-17 race car and the new track, the team was still able to cap the weekend in Indy with a pair of top-six finishes for both Parker Thompson and Luke Gabin in the second race of the weekend. Gabin advanced in both races despite tough qualifying performances, posting a pair of impressive top-10 finishes. 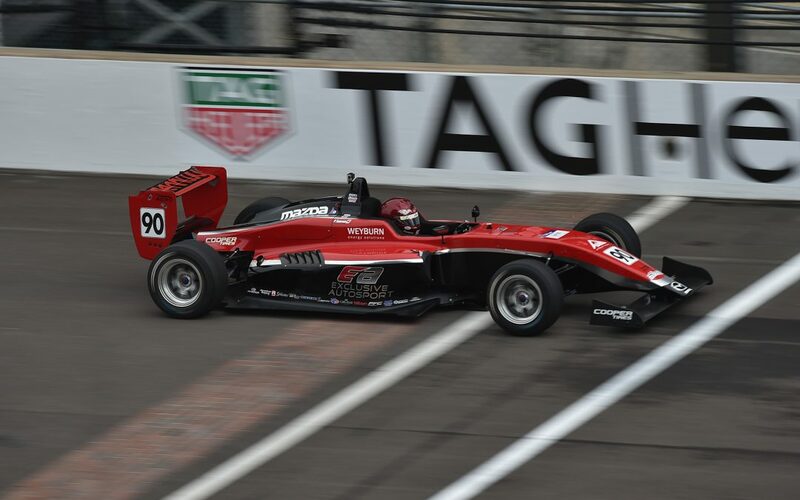 USF2000 debut with Exclusive, carding a pair of top-16 finishes. In the opening race, Thompson was caught out when the initial start was waved off and the driver ahead of him locked up the brakes unexpectedly. The Canadian was forced to pit for a new front wing assembly and lost a lap, and was officially scored in 19th. Gabin started 18th and used his considerable experience to navigate through the mid-pack chaos, working his way forward to a strong 10th place finish, which was a highlight of the day. The whole team was focused on a recovery during Saturday morning’s Race 2, and both Thompson and Gabin attacked quickly to gain spots early. Gore was involved in an opening lap wreck that sent three cars to the garage, ending his weekend. Thompson clawed his way to fourth by the checker and the solid result has put him fourth in points. Gabin completed his impressive weekend with a run up to sixth in Race 2, a 10-position advancement after starting 16th. Luke’s solid top-10 pairing of results have moved him to seventh in the championship standings. The next event on the Cooper Tires USF2000 Championship Powered by Mazda will be an extremely popular stop on the circuit, as the team will travel to Wisconsin at the famed Road America facility. Rounds Seven and Eight will be held as part of the Verizon IndyCar Series Kohler Grand Pix on the 4.0-mile, 14-turn road course in Elkhart Lake, WI on June 23-25.